NetS3 Laboratory, Neuroscience and Brain Technologies Dpt., Istituto Italiano di Tecnologia, Genova, Italy. How a population of retinal ganglion cells (RGCs) encodes the visual scene remains an open question. 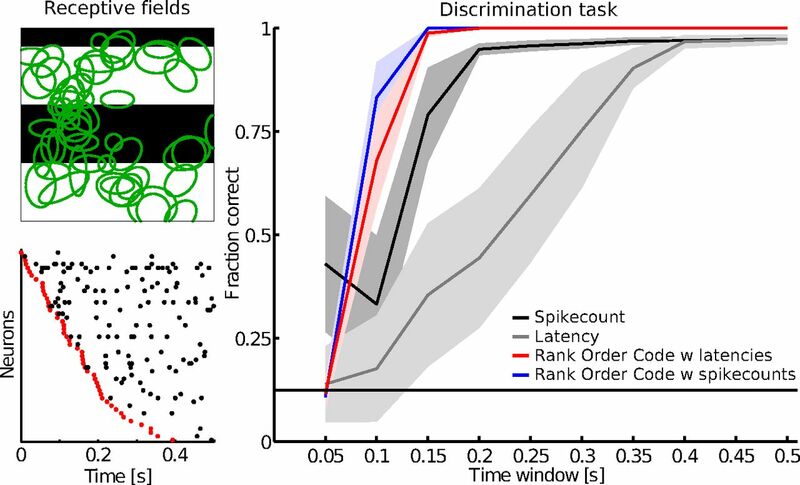 Going beyond individual RGC coding strategies, results in salamander suggest that the relative latencies of a RGC pair encode spatial information. Thus, a population code based on this concerted spiking could be a powerful mechanism to transmit visual information rapidly and efficiently. Here, we tested this hypothesis in mouse by recording simultaneous light-evoked responses from hundreds of RGCs, at pan-retinal level, using a new generation of large-scale, high-density multielectrode array consisting of 4096 electrodes. Interestingly, we did not find any RGCs exhibiting a clear latency tuning to the stimuli, suggesting that in mouse, individual RGC pairs may not provide sufficient information. We show that a significant amount of information is encoded synergistically in the concerted spiking of large RGC populations. Thus, the RGC population response described with relative activities, or ranks, provides more relevant information than classical independent spike count- or latency- based codes. In particular, we report for the first time that when considering the relative activities across the whole population, the wave of first stimulus-evoked spikes is an accurate indicator of stimulus content. We show that this coding strategy coexists with classical neural codes, and that it is more efficient and faster. Overall, these novel observations suggest that already at the level of the retina, concerted spiking provides a reliable and fast strategy to rapidly transmit new visual scenes. ↵3 This work was supported by the 7th Framework Program for Research of the European Commission [Grant agreement 600847: RENVISION, project of the Future and Emerging Technologies (FET) program Neuro-bio-inspired systems FET-Proactive Initiative] and the Wellcome Trust (grant 096975/Z/11/Z). We thank Bruno Cessac and Matthias Hennig for their insightful discussions and the two reviewers who helped to improve the paper.